Alabama – Sewage plants in Alabama will now have to meet tighter limits for E. coli bacteria in order to make it safer to swim and fish in creeks across the state. Several nonprofit water advocacy organizations successfully compelled the state’s government to improve the rules. The new regulations lower the maximum concentration of E. coli that is allowed to be discharged at any given time during the summer by nearly 40%, and increase the period of time those standards apply by 50%, from four months to six months. In 2015, the Black Warrior Riverkeeper, Choccolocco Creek Watershed Alliance, Choctawhatchee Riverkeeper, Coosa Riverkeeper, and Logan Martin Lake Protection Association pushed the Alabama Department of Environmental Management (ADEM) to increase the length of the legally defined summer recreation season to include May and October, which previously were considered part of the winter season when sewage plants are allowed to discharge higher levels of bacteria. The Environmental Management Commission, which governs ADEM, adopted that suggestion into the regulations in December 2016. Additionally, the E. coli limit that applies during that summer season was lowered from 487 col/100mL to 298 col/100mL. The revised regulations went into effect on February 3, 2017. In January of 2017, ADEM was in the process of renewing seven sewage plant permits, posting them for public comment. Eight Waterkeeper organizations sent a letter to ADEM pointing out that those draft permits did not incorporate the new stricter limits that would be in effect by the time the permits were finalized. ADEM corrected six of the seven permits before they were finalized, and later corrected the seventh. Coosa Riverkeeper submitted the letter on behalf of all the Waterkeeper Alliance organizations in Alabama: Black Warrior Riverkeeper, Cahaba Riverkeeper, Choctawhatchee Riverkeeper, Coosa Riverkeeper, Hurricane Creekkeeper, Little River Waterkeeper, Mobile Baykeeper, and Tennessee Riverkeeper. “Lowering the amount of bacteria sewage plants can discharge into streams, creeks, and rivers in Alabama is essential to protecting the health of people and wildlife using the water downstream,” says Nelson Brooke, the Black Warrior Riverkeeper. In addition to the seven permits that were part of the dispute in early 2017, all sewage plant permits in Alabama will incorporate these revised regulations as they come up for renewal over the next five years. That update represents an important victory for Waterkeepers seeking to ensure the state’s waters are clean and safe for use by all citizens. Strengthening bacteria regulations is one part of a broader effort by these Waterkeepers to protect and inform Alabamians who swim, fish, and boat on the state’s waterways. The same Waterkeepers who filed the January letter collaborated with the Alabama Rivers Alliance to file a petition for rulemaking with the Environmental Management Commission in March. To protect public health and downstream recreation, the petition sought to improve the minimum requirements imposed on sewage treatment facilities for public notification of sewage spills. Although the Commission denied the petition, they agreed to work toward its goals. In May, ADEM launched an opt-in email sewage spill notification system which the Waterkeepers and Alabama Rivers Alliance requested. The water advocacy groups have relayed their appreciation for this progress while continuing to promote their petition’s additional suggestions for protecting Alabama citizens from sewage overflows. 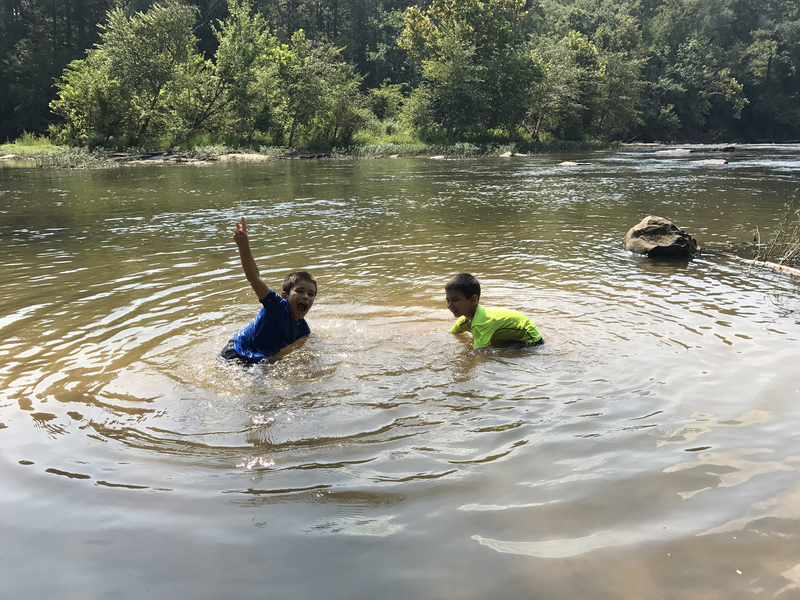 “No mother in Alabama should have to worry about her children going for a swim in the creek,” said Justinn Overton, Executive Director at Coosa Riverkeeper. Black Warrior Riverkeeper is a citizen-based nonprofit organization whose mission is to protect and restore the Black Warrior River and its tributaries. We are advocates for clean water, wildlife habitat, and recreational opportunities throughout the Black Warrior River watershed. To learn about the river and threats to it, visit BlackWarriorRiver.org. Kids can swim in Alabama waters with fewer worries thanks to improved pollution rules promoted by Waterkeepers. Photo by Black Warrior Riverkeeper.